Where Do I Send My Kids? I was interviewed in the South Side Weekly about why I send my kids to CPS. Here is the link to the article on SouthSideWeekly. When students’ education is on the line, having more options isn’t always better if it means that parents and their children are being forced to choose between non-negotiable fundamental values like community, academic rigor, and safety. Yet, many parents and their children face this predicament when selecting between public neighborhood, public selective enrollment, or private schools in Chicago. Emanuel then unclipped his microphone and left after ten minutes of a twenty-minute interview. He’s not the only government official to send his children to schools outside of the CPS system. Certain high-ranking CPS officials have done so too. Recently-ousted CEO of CPS Forrest Claypool, former CPS Board Vice President Jesse Ruiz, and former CPS CEO Arne Duncan sent their kids to private schools in Chicago. A 2004 Fordham Institute study found that thirty-nine percent of CPS teachers did the same. Understandably, critics have pointed out that the decisions of the mayor, CPS officials, and even teachers to send their kids to private schools don’t bode well for CPS’ future. Others have reiterated that, in reality, the things that make CPS schools attractive—a sense of community, funding from the city, and diversity—are being systematically removed by the policy decisions made by CPS officials themselves. These policy decisions include school closings, disinvestment, and funding issues. Meanwhile, CPS educators who support public schools through their work and advocacy often have an impossible choice to make between committing to that support and choosing what they feel is best for their kids. Moreover, CPS educators who are also parents have certain privileges in knowledge and experience that allow them to be better equipped at tackling selective enrollment processes or more discerning in finding ideal educational environments for their children. To some degree, the future of CPS will be impacted by individual decisions—and how they can be used to either uphold a system of segregation and disinvestment or push for more resources and increased confidence in CPS’ schools, teachers, and students. As employees of CPS, do educators have a professional or ethical obligation to stand by their schools and send their kids to them too? Doing so would be a vote of confidence in CPS, but would also turn a blind eye to the widening gaps between CPS schools and alternative educational options—the private and public selective enrollment schools that are less harried by dwindling resources, lack of transparency, and unstable politics of the CPS. The Weekly spoke separately with three CPS educators who sent their children to CPS schools about their respective experiences with CPS as both educators and parents. Their responses have been compiled below. The names of several individuals and schools were left out of this article to protect the privacy of the teachers who were interviewed in this piece and their families. Tamela Chambers, a CPS librarian for almost eight years, cites her personal experience as a student in CPS schools as a large influence in her decision making process as a parent. She currently has three school-aged children—two in middle school and one in high school. David Stieber is in his eleventh year as a social studies teacher with CPS. He has two children in CPS: one in kindergarten, and one that will enter pre-school next year. Stieber declined to name the schools his children attended for the sake of privacy. Sashai Jasper, who worked in the district as a high school teacher in both a selective enrollment and neighborhood high school in South Shore, also worked in CPS’ central office for several years before resigning in March of 2017. Last year, she penned an Education Post blog post about how she pulled her daughter out of a private Catholic elementary school in order to enroll her into National Teachers Academy (NTA) in the South Loop. Jasper is now currently involved in efforts to save NTA from being closed and reopened as a high school. Jasper: The reason I’m sharing about my background and intimate relationship with CPS is that if it’s difficult for me, I can’t imagine how difficult it is for people who aren’t knowledgeable who don’t know the ins and outs of the system. It’s difficult to navigate and that’s by design. I’m interested in learning your thought process as an educator and a parent. How did you make the decision to send your children to CPS schools instead of private schools? Chambers: I am a lifelong Chicagoan born and raised on the South Side, and I attended my neighborhood elementary school and CPS high school. I lived in a neighborhood where my teachers and even my cafeteria ladies were my neighbors, which created a sense of a strong community. We had a relationship. It wasn’t just a teacher, you were also my neighbor. It also made teaching a desirable profession—an honorable profession or something that I could aspire to. So when I had children of my own, it wasn’t even a second thought. It was great for me; I didn’t expect anything different for my children. Stieber: Teaching at CPS can be a challenge because of all of the politics about how CPS is run. My wife is also a CPS teacher so we both try to make our schools better for our students. It can be really depressing because of what I want my students to get that they don’t have. Before I had kids, I loved my students more than anything. But now that my kids attend CPS, it puts more pressure on me to work continuously to improve the schools for both my students and my kids who attend. It puts me under stress personally and professionally. My wife is against the selective enrollment process. She teaches at the neighborhood high school we live in and our son goes to the elementary school that will feed into that high school. I personally envision [that] our son will go to the school he’s at up till sixth grade and go to the neighborhood public school as a freshman. Our kids will be in public school and CPS as long as we live in Chicago. We want to make our neighborhood schools good as well and that’s a whole other struggle. Jasper: The only reason [my daughter] was in a Catholic school is because St. Philip Neri was convenient, down the street, and had a strong community-like family feel. I felt like their pre-K and kindergarten programs were strong and better [than the other schools in the neighborhood], but not necessarily with their upper levels. But it was very clear in my head that [St. Philip Neri] was a temporary place for her. She was going to be there to experience the socialization but I knew she was going to need to be challenged. As a parent, you know your kid and you know what they need and you think you know what they need. Once she was in kindergarten, I could see that she wasn’t being challenged academically. She also wasn’t being fed or receiving the messages to adapt socially and emotionally. She started coming home and not wanting to go to school. She asked me “Am I white? People are telling me that I’m white.” By being in a 98-99% Black school, she was confused and kids were othering her. Of course, I want to protect her, but I wanted her to be exposed to other cultures. I was born and raised in Humboldt Park, and I went to Richard Yates Elementary which was in a predominantly Black and Puerto Rican neighborhood. We had Polish students, white students, so there was more of a mix back then. Chicago is hyper-segregated; in many ways, I feel like it’s gotten worse over the years. It wasn’t until I went to CPS high school that I truly felt diversity that I felt was unreal. I definitely wanted [my daughter] to have what I experienced in elementary school and she wasn’t getting that. [My daughter] is not at Bouchet [Elementary Math & Science Academy] because it’s not diverse. I want her to be around other cultures, other classes. I want her to be open and cultured and she’s not going to get that at Bouchet. What NTA offers in terms of their programs and community involvement is so key to me. Parents at NTA are so organized and have been very active. It’s a flat out lie to say that a select group of parents—or white parents—are the ones making the noise. Everybody is involved and everybody is making noise. I am not one of the most involved parents—I am just doing my part, whatever that is, whether that’s writing an article or going to a board meeting. It’s really a concerted effort by the community. There are people who are in this fight who don’t even have kids that go to NTA. It’s about equity—people are fed up. Would you do anything differently? Do you have any plans to change as they get older? Chambers: I’m pretty much satisfied with the experience. I didn’t bring them to the places I worked only because I wanted them to develop as their own individual person. I think if your child attends the school you work at it makes it difficult to establish their own identity. Other than that, I wouldn’t change anything about it. Stieber: I believe in public education; it should be with great schools with teachers who care about their kids. And the vast majority of CPS teachers care about their kids a lot. But my kids are now experiencing having schools that aren’t being funded the way that they should be and not having enough staff. With the violence in our city, the odds are my kids are going to know people that have been impacted by violence. All that stuff is in your head and is scary, and I have various levels of privilege that shield me more than others because of my income and race, but sending your kids to CPS is scary on many levels because of the way it’s being run at the top. What do you think it says when CPS teachers won’t send their kids to CPS schools? Stieber: I understand the reasons why they might do that. Working in CPS for eleven years and seeing people who worked longer—how have people worked with the chaos of CPS? We’ve had eight CEOs in my eleven years of teaching. It’s one of the biggest reasons why CPS teachers send their kids to non-public schools—they don’t want their kids to deal with what their students deal with or what they don’t have in schools. I get it. Jasper: I’m not surprised by that [thirty-nine percent] statistic. I would have never sent my daughter to [a neighborhood high school] when I was teaching there given what was happening in the area. The academic rigor wasn’t there because we were fighting other battles. There were many times when I would go to work and just focus on classroom management. It was very different when I went to South Shore International College Prep, which is a selective enrollment IB and AP school. The student profile there was different, parents were involved, there was a different culture, a different feel. There were teachers, assistant principals, and office staff that sent their kids there. I knew I wanted to work there because that spoke volumes to me that the assistant principal’s daughter was in my AP class. Or that the security guard and cheerleading coach also sent their kids there. We invest in the school by sending our kids there. But I know for a fact that’s not often the case. Is that only the case for Walter Payton, Whitney Young? If that’s true, that’s sad. That’s sad that if you work at a neighborhood high school, you don’t feel that way. From the eyes of both a parent and an educator, what could or should CPS do to incentivize CPS teachers to send their kids to CPS schools? Stieber: Parents don’t want to look for schools—they want to send their kids to the schools right near them, they don’t want to deal with the selective enrollment because it’s stressful and time consuming. Improve the neighborhood schools. And I think a major first step is to have an elected school board—that shows that people care what parents think, along with no longer closing public schools, or cutting librarians and social workers. Jasper: I think the biggest disconnect right now between our education and our community is that there is no real conversation. I think what we need to do is get to know our communities. There is inevitably a disconnect when you have someone who lives in Beverly and works in Englewood. They go there as a job, not because it’s their community. When I went to Roseland every day from South Shore, it was different from me teaching in South Shore when I lived right down the street. When I go to Walgreens, I see my students. When I go to the gas station, I see my kids. They were my neighbors. Me staying for a basketball game or cheerleading practice was not a big deal. Principals and staff need to do a better job of getting to know their community. Going to community events, bringing in neighborhood clubs for local school council meetings or open houses. There has to be more communication and openness, and it needs to be a partnership. I think that will change that mentality. There needs to be a shift in the places where we go to every day. Your work should become an extension of you and your family. In the service of educating students, it is a service. You shouldn’t have the attitude that this is just a job. It’s about your willingness to invest in that community, regardless of whether you live there or not. If you are interested in learning more/ wanting to advocate for librarians for our schools and our children then click here to get involved. To view this piece on ChicagoNow.com click here. Every year, for the past 11 years that I have taught in Chicago Public Schools (CPS), Chicago claims it doesn’t have enough money to properly fund its public schools. And every year there is some “justification” for not giving our students equitable funding. In 2010, CPS didn’t have enough money and threatened to cut extracurricular programs and non-varsity sports. In 2013, it was “necessary” to close more than 50 public schools, the most schools ever shut down at one time in our country’s history. Now, every year our students watch as librarians, counselors, social workers, support staff, security and teachers are cut. They see how special education has been criminally mismanaged. They wonder why the technology in their school does not work, why paint is peeling off their classroom walls, why their track is unusable, why their heating and cooling vents spew out white clumps of powder, or why there are broken asbestos tiles in their classrooms. Yet through all of this, Chicago always finds money for policing. Throughout my time teaching in CPS, I have heard stories of the abusive nature of the Chicago Police Department (CPD) from my students. At first, due to my whiteness, I had a hard time believing my students, because what they were telling was so different from my own experiences. For me as a white person, the police are at worst a minor annoyance. But for my black students, the police can mean danger, abuse, harassment, brutality and death. It has been well documented that CPD has been terrorizing Chicago’s black and brown communities for generations, going back to the 1960s, with the murder of Fred Hamptonwhile he slept, to the 1970s, with acts of torture led by Commander Jon Burge. This year, Chicago Public Schools students will be learning through the Reparations WON curriculum of the standard torture practices during the Jon Burge era. For about a 20-year period, Commander Jon Burge and his officers would pick up innocent black men and force them into confessing to crimes that they did not commit. His standard methods of getting forced confessions was torture, which included suffocation, putting loaded weapons into mouths and electric shocks to the genital area. Although the Burge torture era has ended, the corruption within the Chicago Police Department has not. CPD has and continues to operate using a code of silence, with secret detention sites like Homan Square, the planting of evidence, falsifying reports and killing people of color in our city. All of these standard operating procedures are well documented. Through all of this, the “union” representing the CPD ― the Fraternal Order of Police(FOP) ― proudly continues to justify these practices. This is the same FOP who is upset about the Reparations WON curriculum, because they want the curriculum to tell both sides. Both sides of torture? Instead of working to improve policing to make sure acts of police torture, abuse and murder come to a stop, the FOP is working to make sure the mandates in the FOP contract protect cops who kill. Over the years, the FOP has negotiated items in the police contract that allows the police to make up stories and intimidate people who might file complaints against them, to name a just a few. Now, Mayor Emanuel thinks the police are deserving of a new $95 million training facility. Just another example of Rahm using taxpayer money for anything and everything besides our students. Rahm will fund River Walks, Navy Pier, basketball stadiums and hotels while stealing TIF funds from the neighborhoods and schools that need them. His policies lead to the cutting of librarians, social workers, counselors, teachers, and support staff. School budgets continue to be cut. Parents go on hunger strikes to keep schools open. Still more schools are proposed to be closed, in Englewood. What message does this send our students? The same thing that our city and country has been telling people of color since the beginning ― that you don’t deserve as much as others. You must survive on less. At the same time schools and our students are having to operate with less, in conditions the mayor would never tolerate for his own children, Chicago is increasing funding to systems, like the police, that harshly punish black and brown children and families. Just recently, a case involving a Chicago police shooting and killing of Ronald “Ronnieman” Johnson shows once again CPD planted evidence, showcasing continued corruption. Ronald was shot while running in 2014. It was claimed that he had a gun and, according to an image put out by CPD, it showed he had a gun. This was a claim his family has disputed. The officers weren’t charged. But now, after a forensic scientist reviewed the image, it has become evident that it is a false image. Meaning Ronald didn’t have a gun. Meaning there is no justification for his death. Before Rahm gives any money to the CPD, he should follow all of the recommendations of the Department of Justice report. In case you missed it, the DOJ investigation was the largest civil rights investigation into a police department in history. The DOJ findings included that CPD was responsible for the use of excessive and deadly force against people who pose no threat, use of force in health crises, exhibit racially discriminatory behavior, having officers with no accountability and who are poorly trained. Until the Chicago Police Department cleans up its act, it should not receive additional funding to build a new cop academy. Police can improve their training methods in their current training facilities. You don’t need a new building to teach police how not to be racist or why they should not kill innocent people. Here is more information about the proposed cop academy, and here are ways to help pressure our elected officials to not support the cop academy. Over nearly a 20-year period, Chicago Police Commander Jon Burge and his officers tortured 110 Black men by beating them, suffocating them, and using electric shocks to force confessions to crimes these men did not commit. As part of a lawsuit that was won by survivors of the Jon Burge police torture era, Chicago Public Schools is mandated to implement a 3-5 week unit in the 8th and 10th grades that teaches students about these horrific events that happened within the Chicago Police Department. The men who survived the acts of torture did not win substantial amounts of money from the city, what they wanted and won was their stories taught in schools in hopes of preventing more instances like this. For more information about what Burge and his men did click here. I am a high school social studies teacher in CPS. My oldest child attended pre-school in CPS and will now be starting kindergarten in CPS on Tuesday. I have heard some parents say, “Well I don’t want my kid learning about that!” or “I will pull them out of school when they learn about that.” A reminder that this curriculum is taught to 8th and 10th graders. If at this age your children are still sheltered from the everyday systemic racism and horrible events of our past, it is long overdue that they learn. Do you think Jewish parents don’t teach their kids about the Holocaust? That Black parents don’t teach their kids about Slavery, Jim Crow, and the on going struggle for equality? That Mexican parents don’t teach their children about colonization, loss of culture, and current examples of racism? Whether you talk to your kids or not they know there is injustice in the world. Here are resources for parents to help their kids understand injustice and then ways to address it. No one likes learning about Slavery, the Holocaust, or any types of discrimination/horrific abuse, but does that mean that it should not be taught? This curriculum does not bash police. 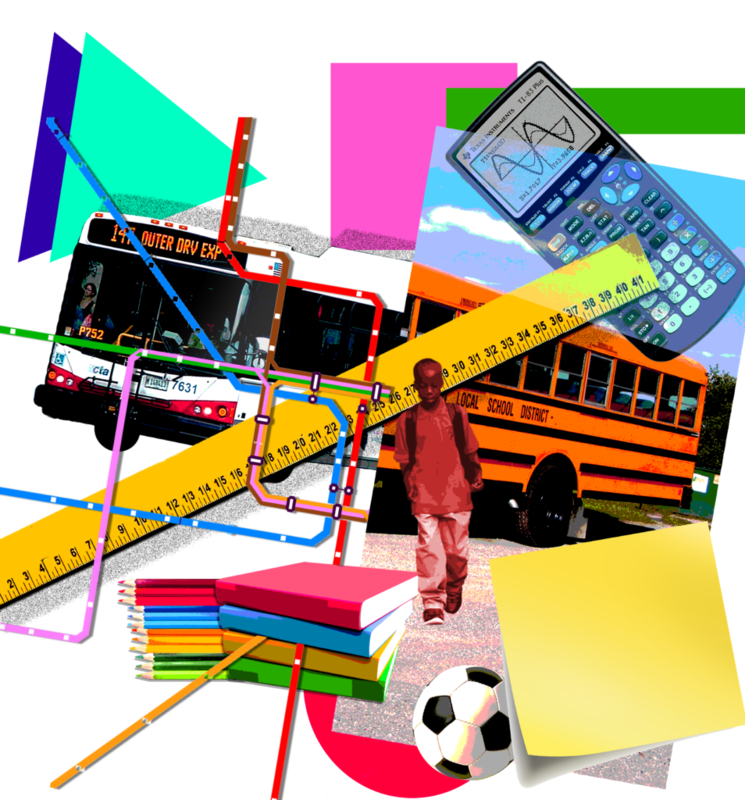 It educates students on what can happen if systems go unchecked. We don’t like bullies, right? Well, let your children learn what can happen if a bully is allowed to bully well into adulthood. I would encourage parents to read the curriculum, by clicking here for the 8th grade curriculum and here for the 10th grade curriculum. Social Studies teachers love teaching multiple viewpoints, but there are certain topics, such as this one, when the other side’s viewpoint isn’t valid. We don’t teach that Hitler or the Nazi’s were really a bunch of misunderstood good guys. We don’t teach that Slave owners were really good people just interested in “helping” slaves. We don’t teach that Columbus was a good guy…well unfortunately some still teach that, but he was a terrible human too. The Jon Burge side of this curriculum is the side that picked up 110 random Black men, forced them to confess to crimes they didn’t commit by beating and torturing them. There is no “good side”. 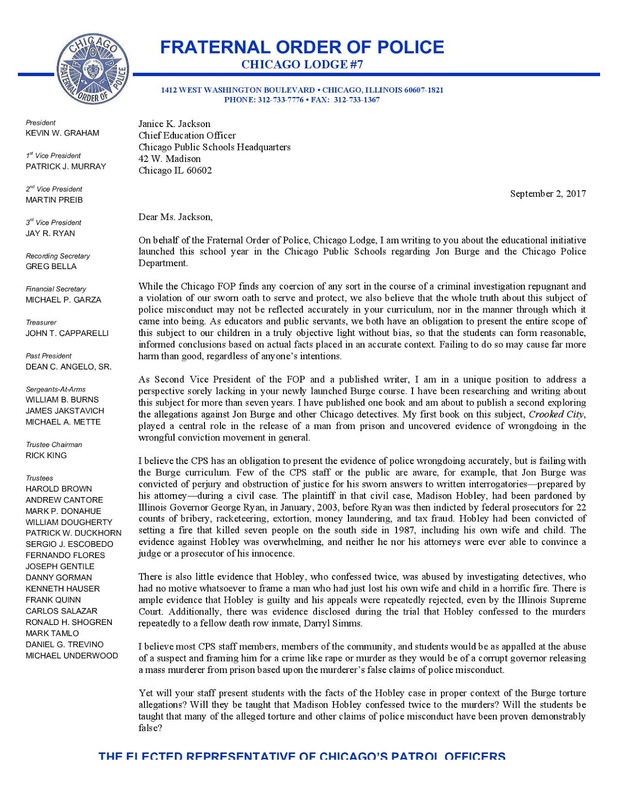 The Fraternal Order of Police (FOP) sent a letter to the leadership of Chicago Public Schools (you can view page 1 of the letter here and page 2 here). Basically asking that both sides of the story be presented while attempting to deflect from the horrific things Chicago Police did under Burge. The courts decided that Chicago Police Department under Burge did horrible things. The courts heard ‘the other side’. The curriculum was then made collaboratively by many organizations. FOP, you had your ‘other side of the story’ chance in court and lost. 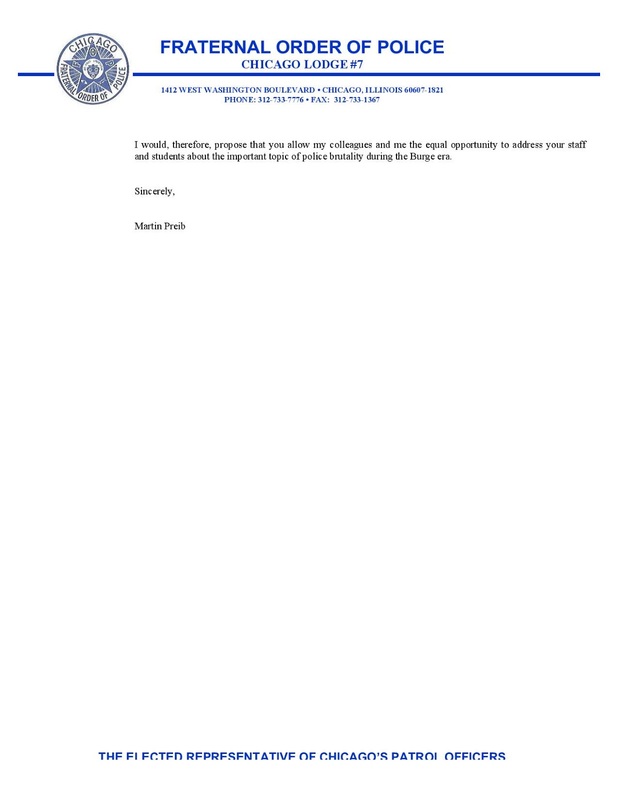 Instead of working to improve policing to make sure acts of police torture, abuse, and murder come to a stop, the FOP is working to make sure the mandates in the FOP contract protect cops who kill and issue a code of silence for any officer who might be wiling to speak up. The Chicago Police Department has a long and tragic history of police abuse that includes the recent deaths of Rekia Boyd, Johsua Beal, Laquan McDonald, Paul O’Neal, Bettie Jones, Quintonio LeGrier, Jose Nieves, Pierre Loury, and Kajuan Raye among others. The Chicago Police Department has been exposed for having a secret holding site at Homan Square, they have been reprimanded by the Department of Justice, cost Chicago taxpayers over $500 million in police abuses cases, have a Code of Silence that tries to prevent officers from speaking up, and has articles in their contract that actually allow for abuse of citizens and cover ups by police. Let me be clear though, the torture curriculum only focuses on what Burge did. It does not address any instance of police abuse, murder before or after him. I know police who have said things to me like, “I’m not a bad guy.” I know some police are right when they say that. It is true that even within a corrupt system like the Chicago Police or policing as a whole, there can be legitimately good police officers. However, until I hear police willing to call out the FOP, take it over, or create a new and legitimate police union then I’ll just say that within every corrupt system there may be a few good apples. Anytime I write a piece critical of police I ask myself a lot of questions. Is there a risk to me in writing this piece? My spouse? My kids? Do I need to try and make sure there aren’t recent public pictures of my kids on social media? Do I need to prevent people from knowing where my kids go to school? Am I damaging my career? Am I in danger? Or are these just irrational fears that I don’t need to worry about? I think these thoughts every time my partner gives me the look that means, “Dave be careful.” I try to be, but then I think about teaching. In college, I was told by a great teacher, that no matter where you teach, if you are going to be successful in this career you need to advocate for your students and then teach them how to advocate for themselves. Since I began teaching in CPS in 2007 I have heard stories from my students of police harassment and abuse. I think about students who have been killed by police. I realize that I must use my various forms of privilege to speak out. I hope soon enough police officers will do the same. There can’t be healing until there is acknowledgement of systemic issues with policing and from there reconciliation can begin. However, as long as the FOP is around, healing isn’t even possible. Jon Burge and his men did horrible things. The reason we teach about these things is to prevent them from happening again. If you are an educator who wants to learn more about this curriculum, I am fortunate to be a part of a group of educators putting together a professional development (PD) that will be offered at the Chicago Teachers Union in the near future on what this curriculum really is and how to teach it. Click here for more information about PD’s offered from the CTU, the dates for this PD are not yet finalized. If you are interested in working to improve policing in Chicago than check out the Alliance Against Racist & Political Repression (AARPR) as they and the Chicago Torture Justice Center have and continue to work to get all the victims of the Jon Burge era freed from jail. The AARPR also are and have been working towards getting an elected Civilian Police Accountability Council, which would make the police accountable to someone besides themselves or the mayor’s cronies. Click here to view this piece on Huff Post. We are leading professional development around the Reparations WON curriclum. Speech to DePaul College of Ed. My speech at the DePaul College of Education 2017 Fall Issues forum on racial inequality in Chicago Public Schools. There were about 250 future educators in the audience.